The Focusrite ISA One recognized around the world for being one of the most dynamic and versatile mic preamps in its class. Loaded to the brim with features, its a classic single-channel microphone preamplifier with an independent D.I which can essentially function as a second channel, allowing you to blend signal from, say, a mic’d guitar cabinet with a D.I’d guitar. The Lundahl L1538 transformer-based mic preamp (XLR and TRS Jack) and independent D.I channel are complete with dedicated gain control, active or passive impedance switch, a TRS Jack output for routing to an amp and an independent XLR output on the rear. This means you can insert any sort of outboard analog gear into the chain. The preamp includes four carefully-selected impedances that allow you to match microphone to input in several ways, giving you a lot of subtle tonal variation. You can drive a sound source to bring out the natural character of a classic microphone, emphasize the tone of the preamp itself, or to go for a totally transparent sound. In total, the Focusrite ISA One offers up to 80dB of available gain—a huge amount that will serve well for any choice of low-output ribbon or dynamic microphone that require some extra juice. It features an insert point, should the need arise to place extra processing between the preamp or D.I. and the optional converter. The front panels also gives you also get Zobel phase-correction at 75Hz, phantom power, and a 18dB/octave high-pass filter. The mic preamp, DI, and VU meter alone offer value beyond its cost. The high-output headphone amp offers zero-latency monitoring of the main input signal mixed with an external mono input, meaning that the artist can record into a high-latency recorder without any delay of the performance in the headphones. An optional 192 kHz-capable digital output board will give you two channels of S/PDIF, ADAT, and AES outputs with word clock in/out. 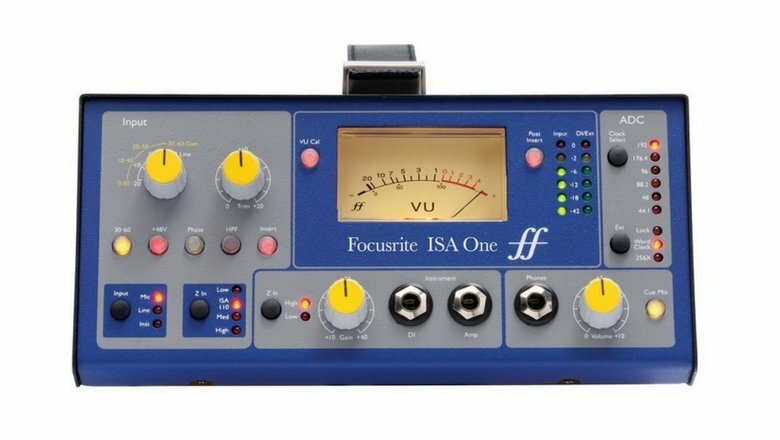 The incredible amount of headroom you get with the Focusrite ISA One along with its absolute clarity means you can really drive the unit without suffocating the signal. It is neutral and clean with a lot of punch that cuts hard. You’ll find that even your cheaper microphones take on an air of class that you just won’t get from cheaper preamps. To help you out on your quest to find a great microphone preamp for your home studio, we’ve included links below to detailed reviews of a few models that make a good runner up to the Focusrite ISA 1.